I became a fan of Ella’s music shortly after ‘discovering’ Frank Sinatra. I had been an avid Beatles fan as a young child, and loved music. One evening – I was 11 years old at the time – my mother said, “You’ve been listening to your music, I want to listen to one of my records” and she played one of the two Sinatra albums she possessed, Songs for Swingin’ Lovers! The fact that I couldn’t hear him take a breath intrigued me. And I can remember the precise, seminal moment: I was hooked was when I heard the track You Brought a New Kind of Love to Me, with its sublime Nelson Riddle arrangement. I eagerly started to spend all my pocket money on my new record collection. Initially, Sinatra recordings and, almost by osmosis, albums by Ella Fitzgerald, Duke Ellington, Peggy Lee, Count Basie and Carmen McRae too. But that was just the start. The concert not only featured the great singer – she was backed by the Tommy Flanagan Trio with guest appearances by both Roy Eldridge and Eddie “Lockjaw” Davis. The repertoire was captured on the album issued as “Ella in London” recorded by the BBC at Ronnie Scott’s. 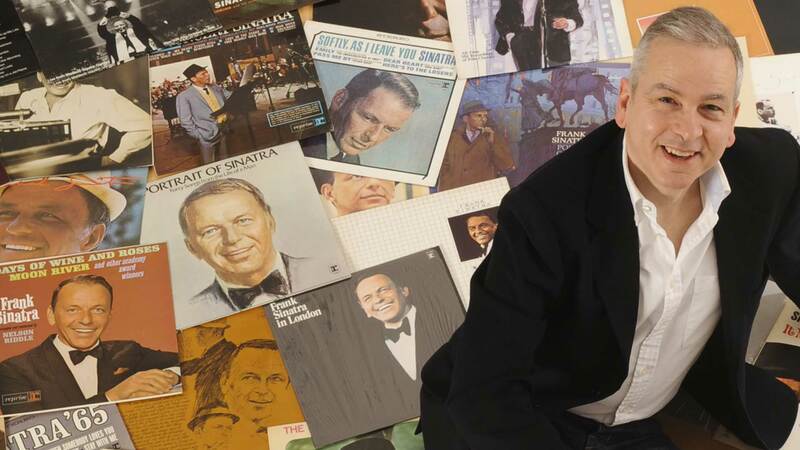 My collection of Sinatra LPs had grown to over one hundred, whilst my Ella records numbered around 20 including her latest release for the recently-formed Pablo label. Norman Granz, who had sold his highly-respected Verve label to MGM in the late 1960s, auctioned his collection of Picassos to fund his new label which, suitably, was named after the artist. It was a lavishly-boxed, 3-record set, entitled “Jazz at the Santa Monica Civic” and also featured Count Basie and his Orchestra, Stan Getz,Ray Brown, Harry Edison, Oscar Peterson along with the aforementioned Eldridge and Davis. Quite a line up. And boy, did I play it over and over… So the idea of, just a year or so later, seeing Ella in concert was incredibly exciting. My father’s then-partner, Margaret, and two of her children were accompanying us. I remember her saying, “Maybe we could meet her afterwards?” and my father replying that the idea was fairly ridiculous! It was a significant comment in that it sowed the seed that maybe, just maybe, one could have the opportunity to meet Ella Fitzgerald! Ella was in buoyant form, although, judging from live recordings made in 1974, her voice was harsher. Surprisingly, this rougher edge to her voice was unique to this particular period of her career. Her affection for the audience and the warm reception she received from practically everyone in the auditorium was palpable. It was a wonderful evening and I clearly remember thinking, as I left the venue, that the memory of it would remain with me always. A year went by and I read with great excitement that Ella was returning to Scotland to play the Usher Hall in Edinburgh with Count Basie and his Orchestra. She was to perform two shows. I was one of the first into the booking office and bought tickets for each show. The 6.30pm concert seat was in the organ gallery, immediately behind the stage (and where, a couple of years beforehand, I had been a matter of three or four feet from Duke Ellington and the venue’s impressive Steinway concert grand). The next show would find me in the row second from the front, centre section. I was all set. I can’t remember precisely when I thought about trying to meet Ella, but approximately a month before the concerts, I made a decision. I was going to visit the venue and speak to the manager, asking if I could be allowed back stage to give her flowers. So, one evening in the week prior to the concert, dressed in my new (read: first) suit, I did just that. To put into context where I was at that time: my parents had divorced in rather acrimonious circumstances, which had resulted in my suffering from clinical depression, leading to four years of near-chronic absenteeism from school and a complete lack of confidence and self-esteem. Several months after leaving school – and whilst waiting to be admitted to a young people’s psychiatric unit – I took a temporary, dead-end job. Looking back, I still don’t know where I got the nerve to be so tenacious! On my arrival at the Usher Hall, a classical concert was taking place and I enquired at the box office if I could meet with the manager. I was escorted to where he stood, in one of the venue corridors, and I explained what I hoped he could help me do. He was cool (in the old-fashioned sense) to say the least, and after I’d said my piece, he said, “I’ll be given a list of everyone who gets back stage. If you’re on the list you’ll get back stage, if you’re not…” and with that, he shrugged his shoulders and walked away. His colleague, who had introduced me to the venue manager, looked at me apologetically, and said, “Listen, son, she’ll be here for a sound check on Sunday around 1.30pm – just wait for her at the Stage Door.” So that became the plan for the day of Ella’s concert. Sunday, November 2nd 1975 at 1.30pm found me at the precise spot, clutching the 20 pink roses I’d purchased the day before (this was long before Sunday opening was commonplace). My mother had, predictably, and caringly, tried to let me down gently by warning me that there would be dozens of people who want to meet her, so “don’t be disappointed if you don’t get even near to her.” Curiously, my mother – who was unwittingly the person who introduced me to Sinatra, Ella and the others in that genre – didn’t want to take up my offer of a ticket for the Fitzgerald-Basie concert. Standing there, waiting, clicking my heels. Pacing a little. Looking at my watch: 1:50pm, and no sign of anyone, let alone Miss Fitzgerald. Just a firmly-locked Stage Door. A car appears. The driver gets out and asks me who the flowers are for. I tell him, and he informs me that he is her chauffeur and he doesn’t have to collect her until 5.30pm; she wasn’t coming to the hall for a sound check. “But,” he added, “she’s having lunch in the Caledonian Hotel – go and give her the flowers there; they love that sort of thing!” I wasn’t so sure. It was one thing waiting at a stage door, and quite another to intrude. Something then made me change my mind: it started to drizzle, and it was looking as though a heavy downpour was on not far behind. So I walked the 200 yards or so from the Usher Hall to just beneath one of the imposing, arched Edwardian windows of the Caledonian Hotel’s smart dining room. And, yes, there she was: Ella Fitzgerald, having lunch, with her back to the window. Her road manager, Tony Edwards, who worked for MAM (the company promoting the tour) spotted me, and told Ella who then turned around, saw me standing with flowers, and gestured to me to come inside. Almost on auto-pilot, I briskly walked through the hotel foyer, into the dining room where the entire Basie band were lunching. The Maitre d’ tried to stop me to ask where I was heading but I just stormed passed him! The Basie band swung like only the Basie band can. Then, Ella with Basie. I recall Sweet Georgia Brown and Them There Eyes and Mr Paganini. Then she sang with her trio: Tommy Flanagan, Keter Betts and Bobby Durham, followed by a rousing crescendo with the full band again. Thanking Count Basie and the Orchestra, she then acknowledged the members of the Tommy Flanagan Trio. And then it came: “I’d also like to thank a young fan who gave me flowers earlier today. I haven’t been able to see you – are you here?” I replied in a sort of meek, stunned way, “Yes.” Being in the organ gallery behind the stage, the next thing I knew there was a powerful spotlight shining on me. Ella turned to the audience and continued, “Do you mind if I sing him a song?” and she headed towards me, but the microphone cable wouldn’t stretch, so Ella asked me to come onstage with her! Shortly after returning to my seat, someone tapped me on the shoulder as Ella was singing her final number. It was some colleague of the Evening Newspaper writer, John Gibson, who wanted to see me for an interview. I told the fellow I wasn’t going anywhere other than to see Ella, so he scribbled down the journalist’s number and asked me to call him the next day. After the show ended, I remember other members of the audience smiling at me as I made my way back stage. We chatted briefly… I got a few short sentences out, mentioning how much I liked her Jazz at the Santa Monica Civic performance which I had brought along to ask her to autograph, which she did: “Thank you so very much. Fondly, Ella Fitzgerald.” I told her how I wished I could sing, and that it must be wonderful to bring the kind of enjoyment to people that she did. “Well, if you’ve got a voice, you go for it!” she replied. Walking back to the main auditorium, I passed long-time Basie band member and sax player extraordinaire, Eric Dixon, who congratulated me on being on-stage with Ella. “That’s a good press story – should be worth ten bucks at least!” The second concert of course was over all too soon. She smiled at me a few times, and even incorporated my name during Mr Paganini. What a night! Three days later, and I was back in the psychiatrist’s chair. The doctor was swaying to and fro on one of the chrome and woven-cane, Bauhaus-style chairs that seemed, at the time, to be a Habitat invention. “And what have you been up to this week?” he asked, in a rather perfunctory manner. “Well, on Sunday, I was on stage with Ella Fitzgerald,” I replied. He practically fell off his seat! Initially, I am sure he thought that I’d cracked. But then he realized it was true, and that was the last time I ever visited a psychiatrist. It took me more than twenty years for me to take Ella’s advice to “go for it” but after my first-ever performance in public in 2001, I started my relatively swift path to becoming a professional singer. In 2003, I was booked to open for Dionne Warwick during her UK tour which prompted me to give up my day job and, as the clich goes, I have never looked back.